As we all know the internet is full of opportunities and there are a number of methods available to create a sitemap for your WordPress blog. The puzzle of getting the on-line store found by search engines has grown into the full-blown profession with a large number of specialists working to optimize sites for search results. We have written several posts on Search Engine Optimization and there exists plenty of advice on SEO strategies to scale your site’s ranking. But despite all the sophisticated practices and thousands of dollars spent globally, there’s one simple approach your company may utilize to attain results that are rapid–Submit the sitemap to search engines. A sitemap is a map of your whole website that reveals the complete structure of your website including links, sections and categories of your website, all on a single page. We call this a traditional sitemap as it’s really meant for the visitors to make use of, to navigate your website more readily. Some of you may know there is an alternative kind of sitemap, a robots.txt file. Creating a sitemap is now one of the first basic steps to be taken in professional SEO tasks. Sitemaps, as the name suggests, are only a map of your website – i.e. on one single page you show the structure of your website, its sections, the links between them etc. While in robots.txt you tell search engines that portions of your website to exclude from indexing in your sitemap you tell search engines where you want them to pass. Check if your site has any already generated sitemap such as: (com/sitemap.xml), it could be generated using Google XML Sitemaps or another sitemap generator tools/plugins. Disable or remove already generated sitemap before creating a sitemap using Yoast plugin. Now sign in to your WordPress site. In your WordPress ‘Dashboard’ first thing you need to do is install a WordPress plugin named ‘Yoast SEO’. On the left-hand side menu, click on ‘SEO’, and it will display you other available options under it. 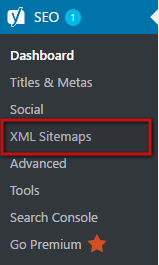 Now click on ‘XML Sitemaps’. Now set to enable ‘XML sitemap functionality’. Right after enabling your sitemap function, you will be displayed with many new options to customize your newly setup sitemap. Click ‘Save Changes’ to activate XML Sitemaps. By clicking on the ‘XML Sitemap’ link you can view your new XML Sitemap. Now your sitemap is ready to submit to all search engines (Google, Bing, Yandex and others). If you find this WordPress guide helpful kindly share it with your friends on social networks. And for any more queries regarding this article, you can always use the comment section below. Really interesting and useful article for creating a sitemap in wordpress…. Thanks for en-lighting us with your knowledge, it is helpful for many of us…! Thanks for sharing with us about sitemaps create in Yoast SEO.. This is very useful for everyone.